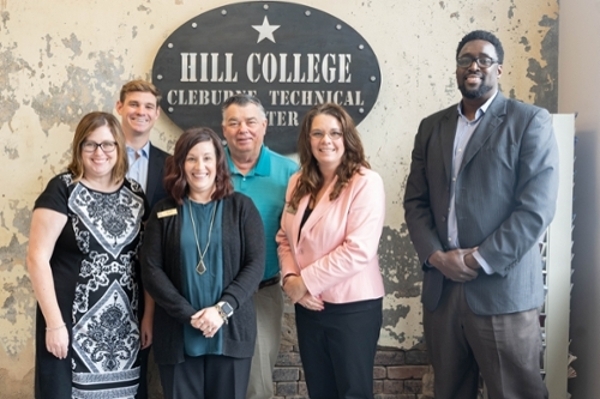 Hill College Continuing Education (CE) Department hosted the quarterly Cleburne Chamber of Commerce Human Resources meeting Jan. 16 at the Cleburne Technical Center, located at 319 E. Henderson Street. Tammy Logan, executive director of continuing education, welcomed the group of human resources staff from various Cleburne businesses and explained the partnership between Hill College, the Texas Workforce Commission (TWC) and the Cleburne Economic Development Foundation (CEDF) and how the partnership is a benefit to them. She also discussed how the College works with businesses to provide affordable professional development training through the continuing education department by working with the TWC staff and grants that are available. Marion Drakes, TWC outreach and project development specialist, discussed the Skills Development Fund that is available to businesses for workforce training and professional development. The Skills Development Grant has up to $500,000 available for companies that have 100 employees or more. This grant is specifically for customized training for 12 months, and the employee is paid while in training. The target average cost per trainee is $1,800 for full-time employees. This grant is for three categories of training: Business Technology, General Technology and Non-technical training. Business Technology training is hands-on and includes forklift, CNC and welding. General Technology training includes safety, OSHA and process improvement. Non-technical training includes soft skills, leadership and how to deal with difficult people. Matt Sniadecki, TWC program manager discussed the Skills for Small Business grant which is for businesses with fewer than 100 employees. The amount available is $1,800 for tuition and fees per new employees who have worked for the company up to one year. This is also available for onboarding new employees. There is $900 available for tuition and fees for incumbent employees per 12-month period. The employee must be full-time. This training grant is for funds for existing courses in the College’s catalog that would benefit the business and employee. Businesses interested in this grant are required to pay their employees prevailing wage in the local labor market for trainees funded under the grant. The businesses must be for-profit businesses. Hill College Dean of Career and Technical Programs Dr. Kayla Kelly spoke to the group about the Cleburne Technical Center and the certificate and degree programs available to the community. Noelle Barnes, director of academic advising, discussed the upcoming Career Fair that will be held Tuesday, April 9 from 2-6 p.m. at the Hill College Johnson County Campus in Cleburne. This event is open to the Hill College students, the 28 area ISDs partners and the public. Mark McClure spoke about the Cleburne ISD Career and Technical Center course offerings in 15 of the 16 career clusters. Following the presentations, the group toured the Hill College Cleburne Technical Center to view the state-of-the-art facility. The heating, ventilation, air conditioning (HVAC) program equipment is available through a partnership with TRANE. The welding equipment is available through Hill College’s partnership with Lincoln Electric. The automotive equipment is available through the College partnership with Snap-On tools. Continuing Education advances individual, community, and economic development through lifelong learning activities resulting in personal and professional enrichment. Registration for all CE courses requires a completed Continuing Education Registration form. Hill College has an “open door” admissions policy, which ensures that everyone who can profit from a college education has an opportunity to enroll. When applicable, courses may have additional registration requirements that need to be met in order to comply with a certifying agency or a funding source. Class schedules and registration requirements are located at www.hillcollege.edu/ce. Registration may be completed by visiting the Johnson County Campus at 2112 Mayfield Pkwy., Cleburne, TX, Room 116 of the Administration Building, or by visiting the Hill County Campus at 112 Lamar Dr., Hillsboro, TX. Payment is due at time of registration. For more information, please contact Continuing Education, ceinfo@hillcollege.edu or 817-760-5820. For information about the North Central Texas Workforce Commission and the training grants that are available contact the Cleburne Workforce Center located at 202 Hyde Park, Suite 200 or call (817) 641-6201. Photo cutline L to R: Dr. Kayla Kelly, Hill College dean of career and technical education; Matt Sniadecki, TWC program manager; Noelle Barnes, Hill College director of academic advising; Jerry Cash, executive director of CEDF; Tammy Logan, Hill College executive director of continuing education; Marlon Drakes, TWC outreach and project development specialist.